White is definitely one of the most neutral interior materials, and integrating it into any room will not be difficult. Also, white furniture is one of the most popular interior decoration solutions these days, so if you would like to be in trend, you should definitely consider this option. In addition, finding matching furniture items will be incredibly easy, given how popular white furniture is. White is not only a classic colour, it is also the kind of colour that can be combined / contrasted with any other interior shade. It can be either other furniture items, or walls, or a floor. In any case, your choice of the second interior colour will virtually be unlimited. The classic contrast will surely presuppose something dark – not necessarily black, but dark. Still, you are free to choose any other contrasting shade you like. White table and chairs, like most other white furniture arrangements, look light and compact – especially in combination with other contrasting shades. Plus, white furniture looks simple and elegant, which is a very nice bonus for any room. It is possible to find white table and chairs in a variety of different materials. Classic interiors will mostly benefit from solid genuine wood. If you are looking for something more modern, you should take a look at high gloss models, covered with a lacquer finish. 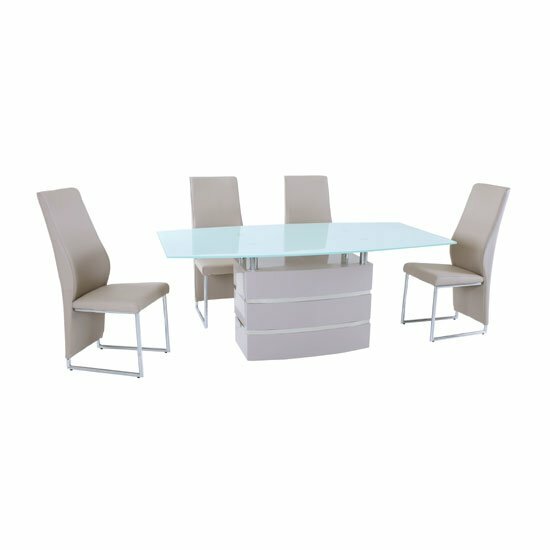 Yet, some of the most sophisticated options for modern interiors would be tinted tempered glass tables. Sure, the materials used for the production play a crucial part when it comes to choosing the right kind of model for your interior. However, shape is quite important, too. This becomes particularly obvious on the example of wooden furniture that can feature several different styles. Practically any design – from contemporary to antique one – can be made of wood, and white table and chairs are definitely not an exception. If you are looking for white table and chairs that would not only look stylish but would also be of high quality, you should take a look at what Furniture in Fashion has to offer. This is one of the biggest furniture stores in the United Kingdom, offering prospective clients a chance to browse through a very impressive selection of items online, or check the same products personally in a showroom in Farnworth. Plus, differently from other e-commerce platforms, this store ensures quick delivery of every purchase, so you will not have to wait for months before your order arrives.